Birmingham, UK (September 22, 2015) – At this week’s NEC Emergency Services Show, Morse Watchmans is demonstrating the value of their automated key control and management systems in emergency situations. Both the KeyWatcher® Touch and KeyBank® Touch, on display at Stand H43, are designed with unique features that provide first responders, emergency personnel and security management with real-time information as to the whereabouts of facility keys and who is in possession of them. The systems also provide archived key access information for investigative purposes. Advanced technology found in both the KeyWatcher Touch and KeyBank Touch features open protocols to allow networking and integration with other key technologies such as access control systems and video surveillance. Centralised control and programming, a global user database and the capability for adding custom notes/information further enhance the systems’ value. Other unique operations that can help in emergency situations include a large, easy to use touchscreen; KeyAnywhere® to allow the return of any key to any KeyBank cabinet in the system; KeyFind® to quickly find a specific key; and an optional easy to use optical fingerprint reader. Accessing keys is also made easier with the larger buttons and an easier to use interface that offers step-by-step instructions. KeyWatcher Touch is an enterprise key control and management system with online monitoring and easy to use, time-saving features. KeyWatcher Touch offers the convenience of scheduled PDF reports that are automatically emailed to authorised recipients. Email delivery of customised or standard reports can be scheduled for any frequency or specific time, or they can be accessed using the Morse Watchmans smartphone app. System administrators have access to view or run reports as needed. The system also enables security management to easily notify a user via email when a key becomes overdue. KeyWatcher TrueTouch® software offers control and management of the system including programming, remote functions and reporting. KeyBank Touch delivers technology and security advantages for accessing, securing and tracking large numbers of keys for custodial, fleet and facility applications. 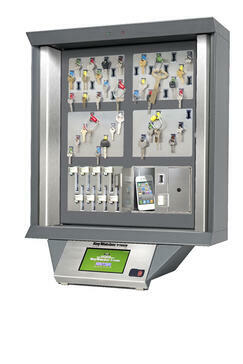 KeyBank Touch can be custom designed to meet individual requirements and scaled as needs change. The common usage of databases, programming and interoperability with a variety of access control devices extends the system’s ease of use across the enterprise. The KeyBank Touch is engineered around a new CPU board with a built-in SD card slot, USB connectivity, 10/100 Ethernet and audio output jack. Each system is AC powered and supported by a battery back-up power supply.